The goodness of natural products such as geraniol, clove and peppermint combined to bring you mother nature’s powerful natural fly fighter. The natural oils are suspended in more than 90 percent water, so it is neither oily nor greasy! 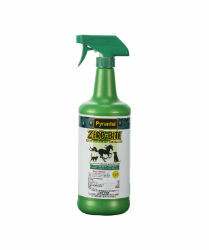 A safe, non-toxic alternative to traditional fly sprays and wipe. Great natural scent. Safe to use on dogs, cats and other small animals too! Repels: Stable Flies, Horse Flies, Ticks, Mosquitoes, Fleas, Gnats, and Lice.